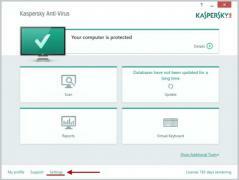 Kaspersky Free is the free version of the popular antivirus solutions Kaspersky Anti-Virus. The free edition comes with automatic updates, the quarantine module, self-defense mode, malware scanner and several others. Probably the most important part for most users that prefer free antivirus solutions, Kaspersky Free is ad-free, meaning it won't nag the users with banners and ads constantly, which is a major plus. The only drawback of Kaspersky Free is the registration requirement, which is mandatory for every user that wants to use this version of Kaspersky. Evidently, there are greyed security modules, available only for users that decide to buy the product. Kaspersky Free is an excellent antivirus solution and even if it's not feature-packed as its paid counterpart, it serves its purpose quite well for the average user. Kaspersky Free works flawlessly with Windows 10, Windows 8 and Windows 7 and it's not that resource hungry as other free security solutions are. If you're looking for a powerful free antivirus solution, we strongly recommend giving Kaspersky Free a try.